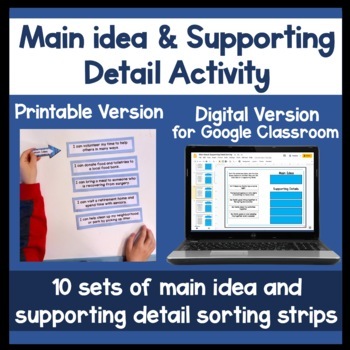 10 different sets of main idea and supporting detail strips to support instruction on distinguishing between the main idea and supporting details. This hands on activity can be a support during reading or writing. Included are ten different strips with four supporting details and one main idea. An optional worksheet with the strips in worksheet form is also included. Please see the preview for a look at the whole product. Beside each purchase you will see a "provide feedback" link. Click on it and you will be taken to a page to leave a quick rating and feedback. **Did you know you can earn TPT credits for paid purchases you review? Credits = $$ to spend on TPT! Click here to check your TPT credit balance.